Day 1, the Pizza Files Summer Binge has started. 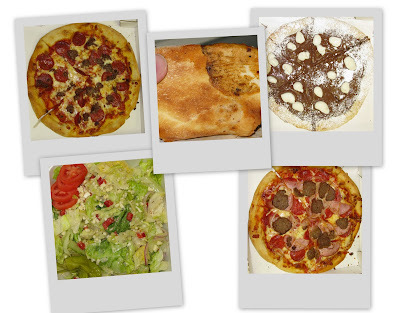 I'm writing this post between bites of Napoli Pizza (One of my favorites), on the menu today is the House Salad, Marinara Pizza and Dessert Pizza (BLISSFUL!!!). You may have to wait a day or two for me to collect all of my thoughts. Stay Tuned. Judah Friedlander doesn't like St Louis Style Pizza. Actor/comedian Judah Friedlander (of 30 Rock) doesn't like St Louis Style Pizza. You will have to follow the link to see just what he had to say about it in the 3rd paragraph. Don't feel to bad St Louis he thinks Manhattan pizza going down hill also. Thanks to Slice for the tip. If you are a native St Louisan I'm sure you know all about Imo's already, and you needn't read any further. For everybody else, if you have lived here (St Louis) for more than a day or two you have probably eaten Imo's Pizza, or at the very least have had someone (almost always a native) tell you how great Imo's Pizza is. Imo's web-site state's that Ed and Marge Imo opened the first one in 1964 at the corner of Thurman and Shaw in south St Louis. At the time you could get your pizza to go or delivered (possibly the first delivery joint in the U.S.). They credit the square cut pie to Ed being a tile setter prior to becoming a pizza maker. Today Imo's is a regional pizza chain with just under 100 locations, most of which are in the St Louis Metro area. They provide dine in, carry out and delivery, including delivery of all menu items. They have a full menu including salads, appetizers, pasta, sandwiches and desserts, not to men tion pizza. The menu indicates that all pizzas are St Louis style thin crust topped with "REAL" Provel cheese and fresh (not frozen) meats and vegetables. They do have a "Thicker Crust" available, but no other information is provided in the menu I have. The pizza reviewed came from the Imo's Pizza located in Wildwood, MO, it was a 12" with Canadian Bacon, hamburger and onions. Normally I always get pepperoni on my pizza, but I didn't actually order this pie, more on that later. I also received a small house salad (iceberg lettuce & Provel cheese) with the House dressing (sweet creamy Italian). As is typical of St Louis style the crust is of a very uniform thickness edge to edge. Also the sauce covers the crust completely leaving no place for the cheese/topping matrix to anchor it's self, leading to topping slide. If you look closely at the whole pie photo above you will notice that sometime after cutting the pie all of the cheese and toppings moved toward the 1'o'clock position. The crust was crispy and was able to support the toppings without help, as far as St Louis style goes it was adequate. I found the sauce a bit bland, not much else to say about it. The Canadian bacon, hamburger and onions were of fine quality, but could have benefited from some pepperoni. The "Real Provel" cheese is well, real processed cheese. The pizza overall was lacking, pepperoni's would have added some much needed flavor and in my personal opinion the mozzarella cheese would be alot better. The small house salad is just fresh iceberg lettuce, shredded provel cheese and your choose of dressing. I chose the house dressing (sweet creamy Italian). Here comes the weird part... I really like Imo's salad, their house dressing is very good, and the provel cheese is great. As I've stated in a previous post, St Louis style pizza doesn't pass the "Would I pay for it" test, and if I would have had to pay for this pizza you wouldn't be reading this. As it turned out a family member who like's to eat a Imo's new I was home alone and without any dinner, so bought me the pizza and salad unsolicited. If you are a fan of Imo's Pizza you are going to eat it whether I tell you to or not. If you have never had Imo's and somebody else is paying by all means try it. Imo's Pizza is located at 16447 Village Plaza View Rd. in Wildwood, MO. You can reach them at (636)458-9000, for more information check out their web-site (click on the title link). Would I eat at Imo's Pizza again? Sure, but on somebody elses dime. Shoot I might even pay for the salad.